At this year's SPS IPC Drives, taking place from 28th to 30th November 2017 in Nuremberg, Germany, the Polyrack Tech Group will be presenting itself as a cross-technological partner for standard and customised enclosures and system solutions for a wide variety of markets. On show will be the EmbedTEC for Small Form Factor. Based on its enclosure platform EmbedTEC, Polyrack now provides a versatile housing solution for small form factor boards. The visually appealing aluminum desktop housing is the enclosure for small form factor boards. It comes with an interchangeable I/O-shield and an improved aluminum top cover for heat dissipation. This cover can be replaced with a heatsink for upgraded performance if needed. Also at the show will be the PanelPC case. The PanelPC 2 series is particularly suitable for industrial applications, even in an extended temperature range (-20 to 85°C). The case is available in 'milled aluminum' and as sheet metal solution from 10.1-21.5" up to protection class IP54 (IP68 in preparation). The multi-touch PCAP touchscreen is also available with hardened glasses and/or anti-fingerprint coating. 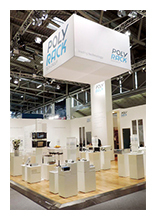 Visit Polyrack at booth 171 in hall 5.